I was taught to poach my eggs in boiling water, which is effective. Even more effective is if you add a little vinegar. Later, I progressed to a proper egg poacher with plastic cups. It's quite cool. 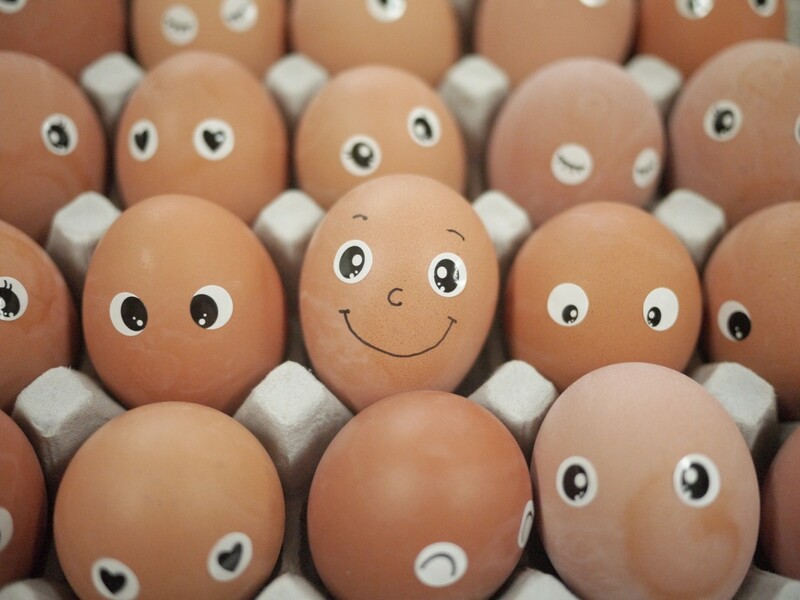 It keeps the eggs confined to a formed shape, but the tops always cooked quicker than the bottom. We arrived at our pièce de résistance when we replaced the poacher with metal cups. Now the whole egg is properly poached once the top of the egg is fully cooked. Here I share my experience with you on poaching eggs and I look forward to hearing how others poach their eggs and their experiences. The way I was taught, poaching eggs in boiling water is simple and effective. All that's required is a saucepan of water to boil and the required number of eggs. To reduce the risk of the water boiling over and causing accidents, the saucepan should be less than half full with water. Once the water is boiling, crack the eggs into the boiling water. The white of the eggs on contact with the boiling water cooks almost immediately, so you'll only want to keep them in the boiling water for about a minute (so the yoke doesn't harden), and then remove them with a slotted spoon to allow the water to drain as you lift the eggs from the saucepan. Then, place onto a slice of buttered toast (buttered with margarine for a healthier breakfast). If you poach eggs this way, the whites become a shapeless mass, so adding a spoonful of vinegar to the boiling water before adding the eggs can help to bind the egg white together. Be careful not to add too much vinegar, otherwise the eggs will be too vinegary. 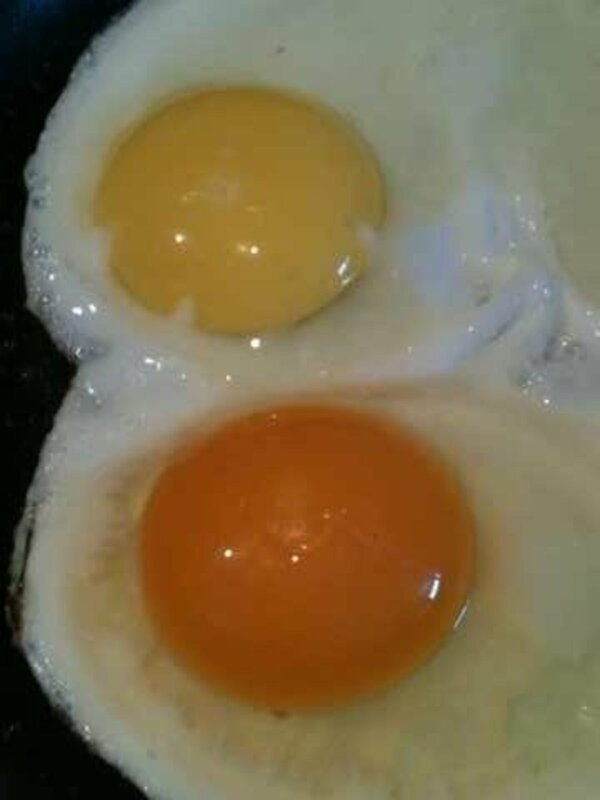 As you may notice from the photo, adding a little vinegar helps keeps the white together so that the egg looks more like a fried egg than a poached egg. Some recipes will suggest adding salt to the water to taste, but I advocate not doing so because we have too much salt in our diet as it is. This is my preferred method for egg poaching because the eggs take the shape of the cups, so you're guaranteed a perfectly uniformed shape every time. Fill the pan halfway with water. Grease the cups (even if it says non-stick). Crack the eggs into the cups. Place the toughened glass lid on top. 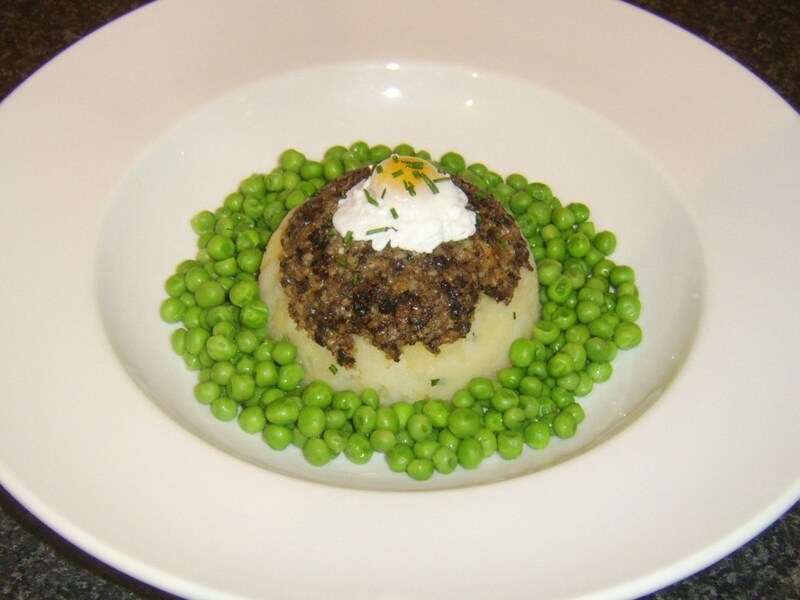 Remove the eggs when poached. Even if the cups are non-stick, the eggs can sometimes be a little difficult to remove if the cups are not greased. I found that greasing the cups with a little margarine helps. But, even then, the eggs can sometimes stick a little. 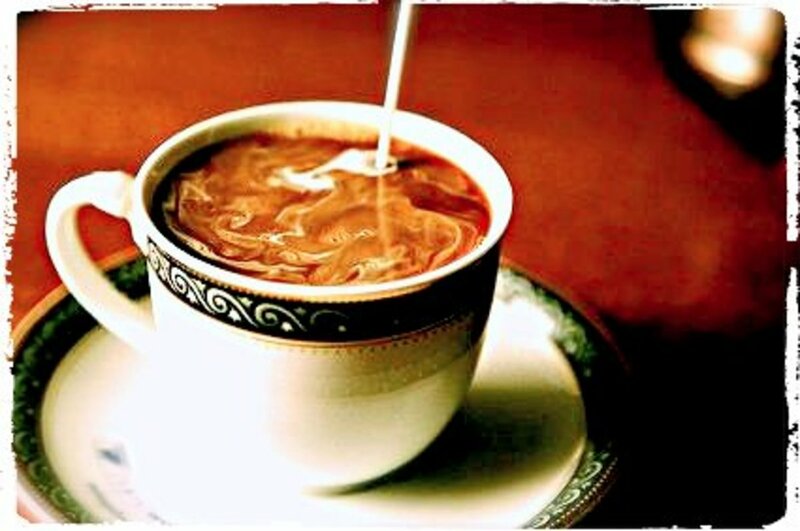 The most effective method I've found is to pour a little vegetable cooking oil into one of the cups and swirl it around. Pour the surplus oil into the next cup and swirl it around again, repeating the process until all four cups are suitably oiled. Then, pour the excess oil from the last cup, either disposing of it or pouring it into a frying pan for later use. Even though the cup handles are plastic (phenolic) and the claim is that they don't get hot, they can still get a little hot. You can still have heat rising from the pan, water, cup, and eggs so you may wish to use a tea towel (or something similar) to hold the cup handles when removing the eggs. If you've oiled the cups with vegetable oil, then the eggs will easily slide out of the cups when you tip them sideways. If they need help, you can prod the edges with a knife. 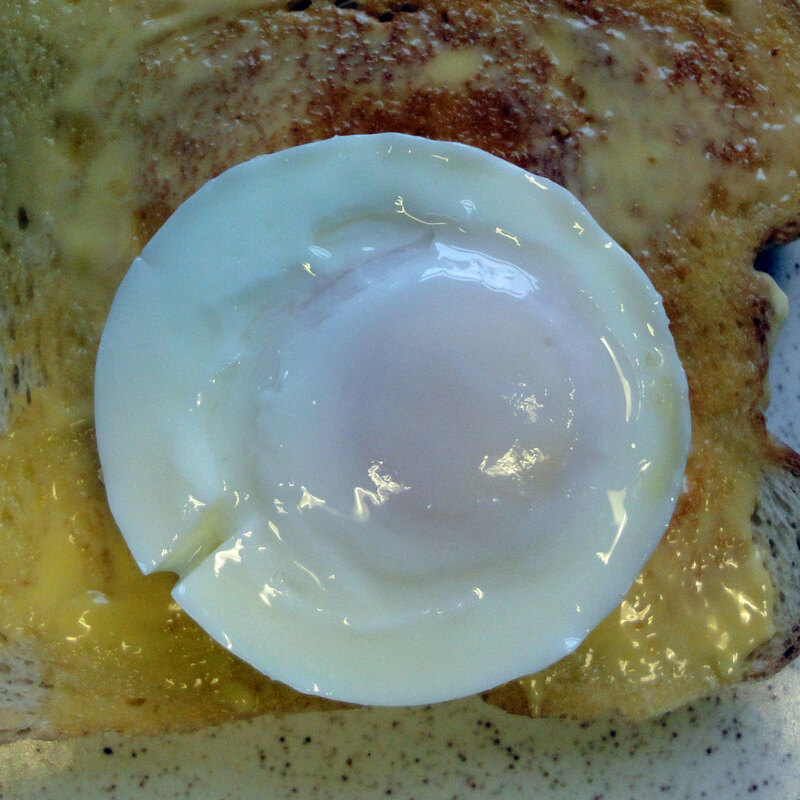 Most poacher egg cups are plastic, which is ok, except that plastic is a good insulator so when the top of the poached egg is cooked, the bottom is still raw. The only way to know for sure when the whole egg is properly poached is by periodically removing the lid and poking a knife down the side of the cup to see if it's cooked or not. The risk is that if you leave it too long, you end up with your yoke being too hard. We had an egg poacher as described above for years until, one day, it was left unattended on the hob for too long. The water boiled away and the plastic cups melted. Our replacement poacher was identical in every way, except the cups were metal rather than plastic. This proved to be a big bonus. Its use in principle and practice is identical to that described above, but because the cups were metal rather than plastic, the eggs cooked from the bottom as quickly as they were steamed from the top (with the lid on). This is because metal is a good conductor. So now, as soon as I see that the top is cooked, I know the bottom is too. The whole egg is, thus, properly poached with a nice soft yoke. Smear the cups with a little vegetable cooking oil (I find this works better than margarine) to minimise the eggs sticking to the cups. Fill the egg poacher to about half full with water. Place the egg poacher on the hob and turn the heat to full. Crack the eggs into the poacher cups. Place the lid over the poacher and wait until the top of the eggs turns white and the sides are cooked. The sides can easily be checked by gently running a blunt knife around the edge of the egg to see if it lifts away from the poacher cups. 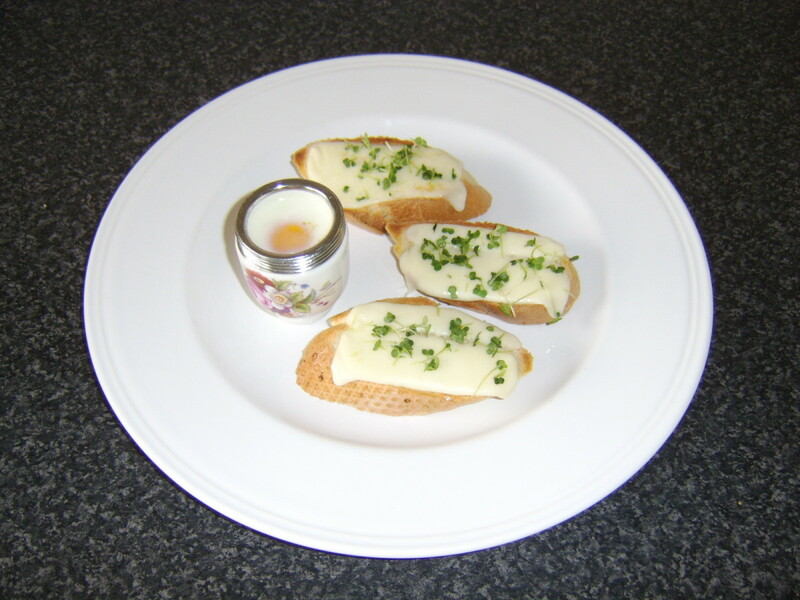 When poached, remove the eggs from the poaching cups and place them onto toast. Although egg poachers with plastic cups are good, egg poachers with metal cups are even better. However, finding metal cup egg poachers can be difficult because they are less common and a lot of the descriptions are misleading. Often, the manufacturer's description will claim that the egg poacher is either steel or aluminium, giving the impression that the cups are metal. But, in fact, it's only the pan that is metal; the cups are plastic. Therefore, if you're seeking out an egg poacher with metal cups, you'll need to find one where the manufacturer's description specifically states that the cups are metal. Aluminium conducts heat better than steel, but as long as its metal (aluminium or steel) it will do a good job. The only point to watch out for with aluminium is that the cooking area where food comes into direct contact (in this case, the cups ) should be coated, usually with a non-stick surface. This is because direct contact with aluminium in cooking will impart some of the aluminium into your diet, which over time can be a health risk. I recommend this Norpro Stainless Steel Egg Poacher Skillet. It poaches up to five eggs and comes with stainless steel cups. Rather than a full egg poacher, an egg poacher without a skillet works in the same way, but takes up less storage space. I recommend this Norpro Non Stick 4-Egg Poacher. It comes without a skillet so it takes up less storage space and can be used in any suitable-sized skillet or frying pan you may already have. Other options for poaching eggs may include cups for use in the microwave and egg rings. We do have some microwave cups, but since I have a perfectly good egg poacher, I've never tried them. The egg rings are designed to get the perfectly shaped fried egg. I guess they could be used to poach the eggs if you use water instead of cooking oil in a pan. This is kind of the halfway method between the two methods discussed above. It would be interesting to hear if anyone has experimented with egg rings in this way. 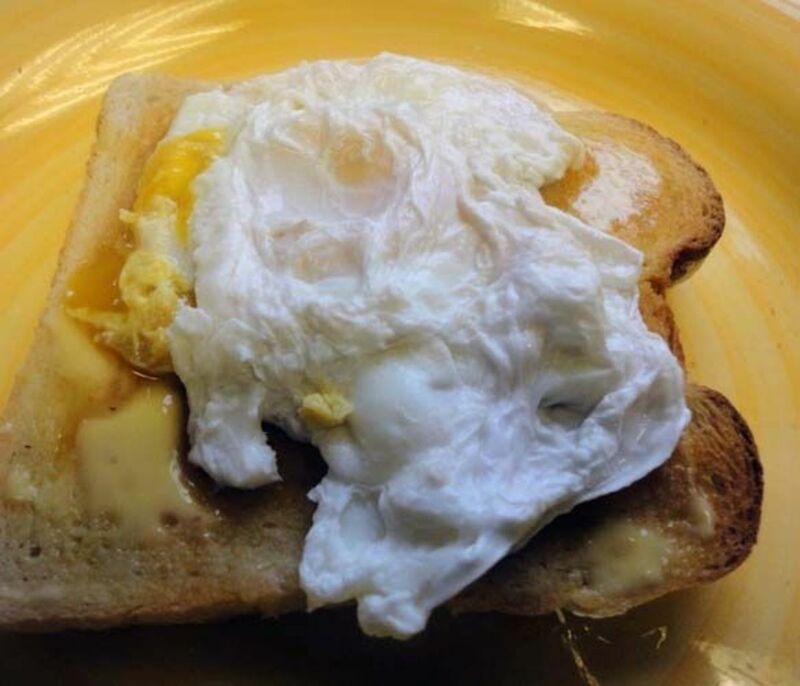 Poaching eggs is quick, so you’ll want to start toasting your bread before you poach your eggs so that you can butter the toast (with butter or margarine) while the eggs are poaching. Fill the saucepan one third of the way full with water and place on the stove on high heat. Optionally, add a spoonful of vinegar (to help bind the egg). 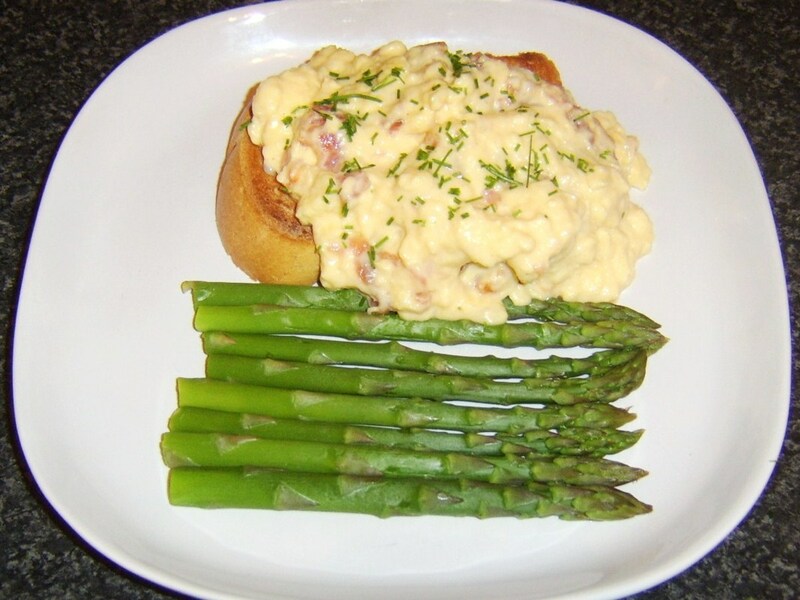 Promptly remove each egg with a draining spoon and place on toast (one egg per slice of buttered toast). Immediately serve (while still hot) as a wholesome breakfast, quick lunch, or a light evening meal or snack. There are few things better in life than a well poached egg. I have never done an egg in the microwave. I have used the egg rings before, but I didn't like them and they were just something else that needed to be cleaned. I usually either hard boil or fry sunny side up. I saw Jamie Oliver line a ramekin or similar small container with cling film. Crack an egg into it. Pull the sides of the cling film up and twist. 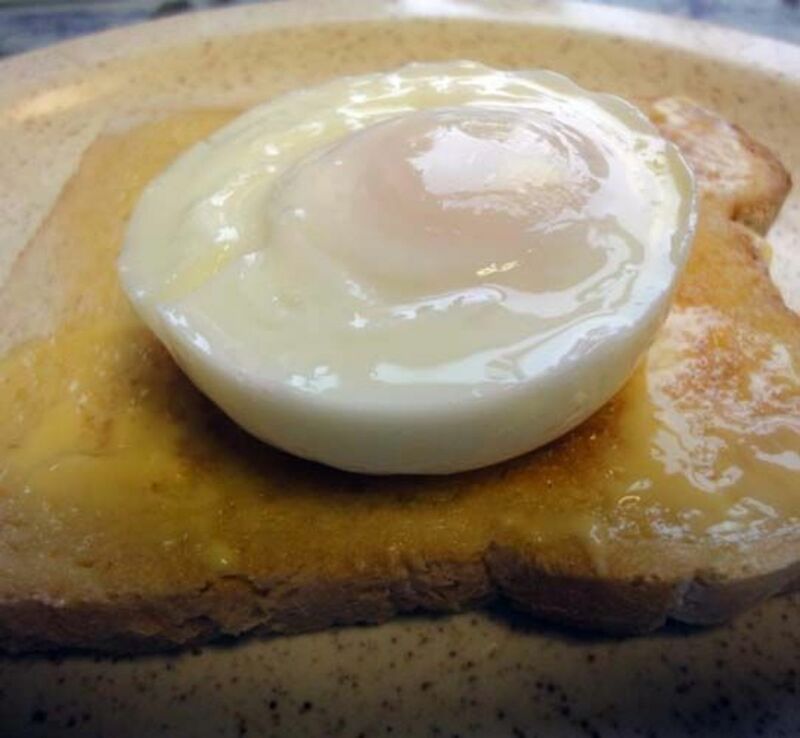 Drop into poaching water for the perfect poached egg. 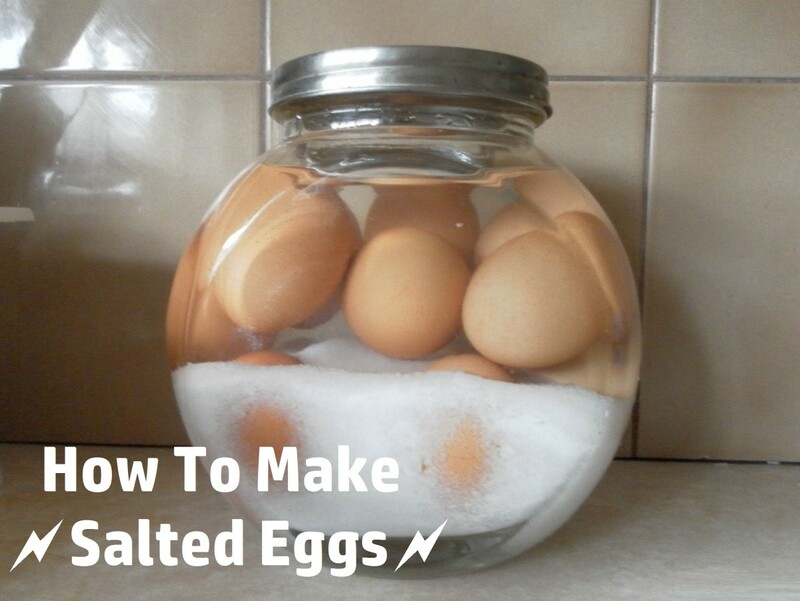 This has reminded me to poach some eggs, so well done (the article, not the egg!) and blessings.